You're probably wondering what on earth I am picturing! he he he... It is actually the beginnings of a Victorian cat doll that I am working on for an exhibit in May. 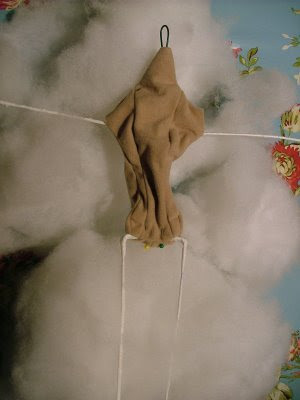 Here she is floating on some fluffy "stuffing" clouds on my brightly-covered desktop. She looks like she's getting ready for a parachute jump doesn't she?!! Notice how her knees are 'backwards', like a real feline?! I don't think I've spoken much about my love of dolls... about how I adore their tactile quality, their pretty little faces, the joys of cuddling a 'little person', oh, and the vast array of costumes to choose from. Yep - you've guessed it - I just LOVE dolls!!! I live and breathe dolls! I am the female equivalent of Peter Pan... the girl who never grew up... and I don't intend on starting now! he he he... I'm sure I'm not alone! Right, I need to give you a bit of history to this story. When I emigrated to Australia five years ago I couldn't believe my good fortune to live so close to Ringwood - the meeting place for the Australian Cloth Doll Association (ACDA). It still took many months before I actually joined the "dolly club", as I call it, as my own little doll, Rosie, came into the world and took up rather a lot of my time. But I visited the bi-annual ACDA doll exhibition two years ago and once I re-hydrated again from all the drool I lost at the show, I signed up and have never looked back. At the time I was a big sucker for rag dolls and rather liked a touch of prim too. I still do! 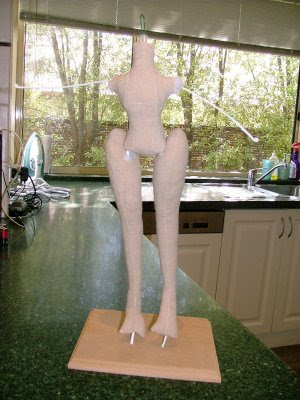 But there is soooo much to learn about making dolls, always something to learn, in fact. The ladies at the dolly club are amazingly talented, and their imaginations are as wild as they come. We meet on a monthly basis, have a "doll of the month" competition, followed by Show & Tell, and there is always something organised be it a demonstration or a guest speaker. Members get to borrow books from an extensive library and people sit and chat, drink tea, swap dolly stories and are always willing to share their knowledge and advice. I never fail to return home brimming with enthusiasm and amazement at what I've seen during the day. Back to Madame la Chat! Who's she? 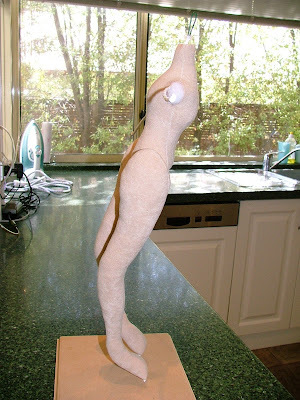 She's the doll I'm making from a pattern by Stephanie Novatski. The dolly club organised a sewing weekend in February to create this doll, but unfortunately I got tonsillitis that weekend and missed the event. However, I am determined to complete this doll and fortunately the pattern has been incredibly well-written and is easy to follow. So I shall show you my progress along the way. This is the first doll that I've made requiring a wire armature (the bones of the body). It was tricky at first, getting stuffing into all the right places around the wire. But hopefully the arms and head will be easier to stuff, and then the fun begins! The face! The needle-sculpting! The costuming and wigging! Ooh - bring it on! Meeeeowwww!!!! If you are in Melbourne and free on Sunday 3 May, it would be lovely to see you at the exhibition! There will be an extensive display of amazing dolls, fun demonstrations and trading tables. You could make a day of it! Go here to see full details. If you're a doll lover you won't be disappointed! Right! I'd best go and lick my whiskers and get on with the job in hand... before I curl up on the end of the bed and have a snooze! Can't wait to see Madame La Chat all finished Vikki, she is looking very sleek and Catwoman-ish. Looks quite tricky . Can't wait to see her finished . Hey Vikki, I look forward to watching Madame la Chat's progress. Hope to get a personal introduction at our next show and tell. I'm looking forward to see Madame la Chat. I'm not a doll person, but I like to look at them. Do you like the dolls from Tilda? Over here we have the patterns with the supplies you need to make a doll. You are one very talented lady, what else do you have up your sleeve? I'll be watching to see how Madame La Chat emerges. I look forward to seeing Madame all done up.